Perhaps the most dramatic improvement in Britain’s way of life in the 20th century was the change in the place of women in the nation’s working life. The foundations for this change, which only reached a climax later in the century, were gradually laid in the decades before World War II. 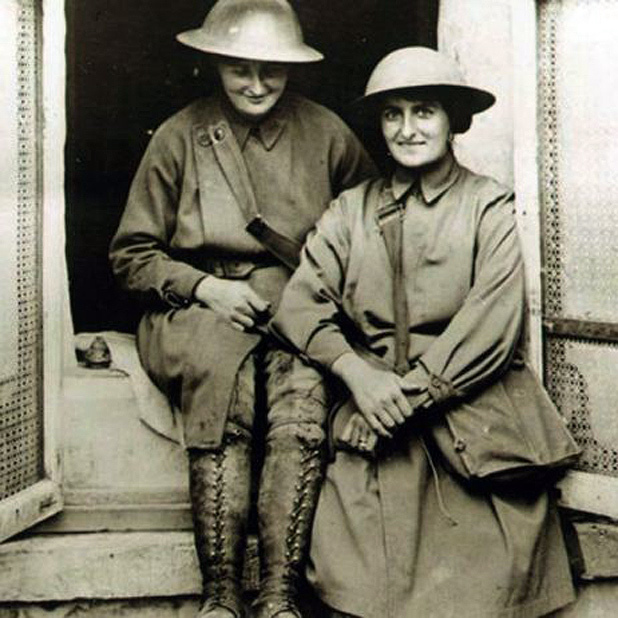 Even before World War I, when hundreds of thousands of women took over the jobs of men fighting in the trenches, only to lose them within a year of the Armistice, there had been many signs that women would not be willing to remain so totally subservient to men, either in the workplace or in private life. For women to gain their rightful place as fully equal partners in working life in Britain, two male-dominated organisations had to re-think their attitude to them: Parliament and the organised labour movement, as represented by the Trades Union Congress. There were politicians and statesmen in Britain in the late victorian age who believed that women should be given the vote – after all, the former British colony of New Zealand had become the world’s first sovereign state to give women the vote in 1893 – but there were few of them. The women’s suffragist movement began in order to get women the vote, which was to be a first step to improving the appalling sweated labour conditions under which so many women worked. When the much more militant suffragettes of the Woman’s Social and Political Union got into their stride, they lost sight of the reason for wnating the vote for women, and getting the vote became an end in itself. It has been said that their often violent militancy actually put back for years the chances of women being given the vote. The Women’s Social and political Union was founded in 1903 by Mrs Emmeline Pankhurst, a long-time member, with her husband, Richard, of the Independent Labour Party. 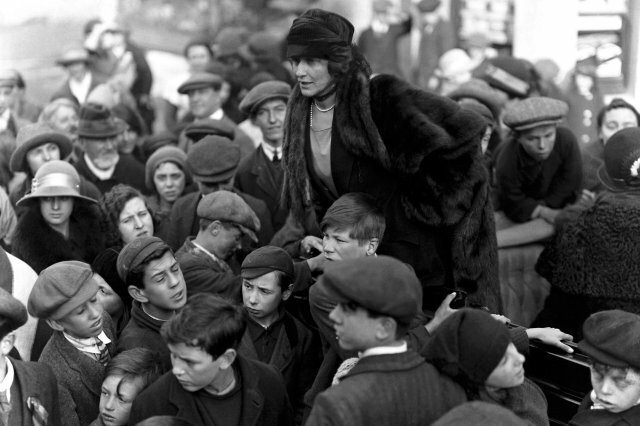 At first, the main aim of her organization was to recruit working-class women into the struggle for the vote, because she thought that having the vote would help improve their often appallingly poverty-stricken lives. Before long, however, she and her daughters, Christabel and Sylvia, were all active – often violently so – in the women’s suffrage movement for its own sake and lost sight of their original motivation. Their activities led to their arrest and imprisonment many times. By the time of her death in 1928, Mrs Pankhurst had turned her energies to the Conservative Party, and was adopted as one of their candidates in London’s East End. Only her daughter Sylvia remained active in Labour politics. When women over 30 were given the right to vote in general elections in 1918 – women over 21 had to wait until 1928, the year of the ‘Flapper’ vote – it was much in recognition of the essential role women had played in the workforce during World War I as for the activities of the suffragettes. Women feed the charcoal kilns used for purifying sugar at a refinery in Scotland, circa 1916. The first women’s trade unions were formed in the later years of the 19th century. In 1874, Emma Paterson, a bookbinder, organised a general union for women which she and another woman represented at the Trades Union Congress in 1875. Her union, called the Woman’s Trade Union League from 1891, was influental enough to cause several other women’s trade unions to be formed in England and Scotland before the turn of the century. Emma Paterson and her successors had an uphill battle to get the TUC to do more than pay lip service to the value and importance of women’s trade unions to the labour movement. Women had long had their own trade societies and associations, covering trades such as tailoring and textile manufacturing, which could be said to be women’s work. Many men, however, were actively hostile to the idea of women coming in to what were traditionally seen as men’s trades; they thought that the presence of women could mean that wages would be reduced and the emphasis on skills diminished. 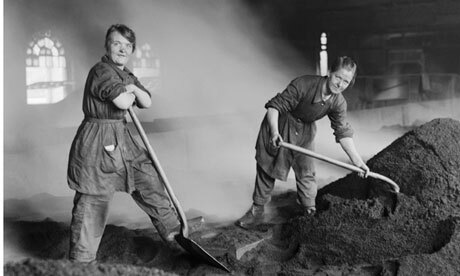 In 1916, despite the gravity of the war situation and the importance of the docks to the nation’s survival, a scheme to allow women to work on the Liverpool docks had to bee abandoned because the men refused to work with them, even though they were to work in a separate section of the docks and they would be paid less. 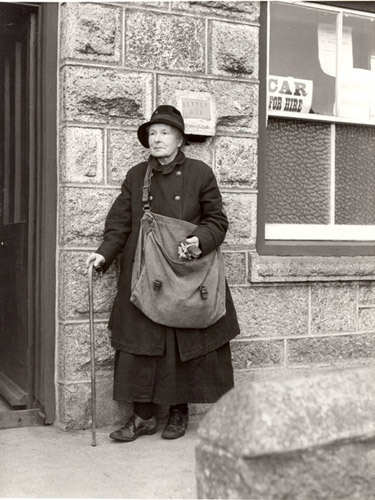 Mrs P. L. Matthews, Cornwall’s oldest postwoman, 1935. Another reason why the TUC did not have to waste time considering women was that very few women were able to take on the sort of work that was recognised as being worthy of trade union status. In the Edwardian age only about 8 % of women with jobs joined trade unions. 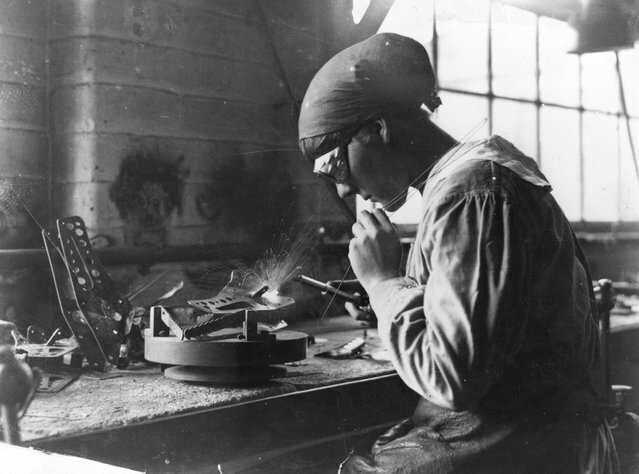 Until World war I, domestic service was the biggest single source of work for women in Britain. The textiles and clothing industries came next – hence the formation of the Society of Glasgow Tailoresses and similar unions in the 1890s. Even after World War I, when the numbers of women in work began gradually to rise, the proportion of women in work was kept down by the almost total rejection of the idea that married women should work: their place, unless they were very poor, was in the home, looking after the family. A contributory factor in the gradual rise of working women in the 1920s was the dreadful death rate of World war I, which decimated a generation of young men. This meant that many women were destined to life-long spinsterhood: having a job with a reasonable salary was essential to them. 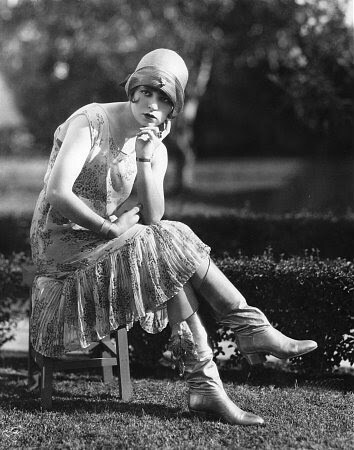 For the unmarried flappers and bright young things of the 1920s, the working world was much brighter and more exciting place than it had been for their mothers and even their elder sisters. 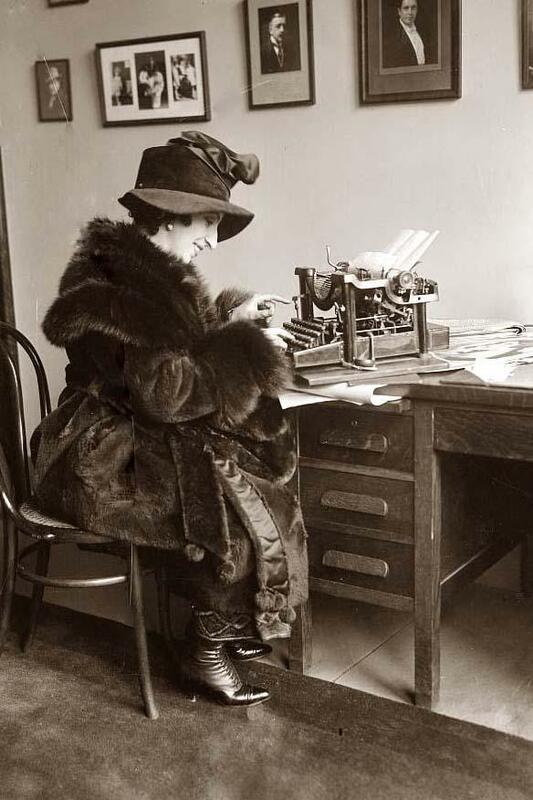 The growth of light industries and the wide-ranging development of commerce, banking and insurance, and of the catering and entertainment industries, brought about a revolutionary widening of the work horizons for women. Working class girls with limited education could find all sort of interesting jobs in the new, airy factories of light industry, and in shops, cinemas and those wonderful new eating places, with their white table linen, shining cutlery and a vase of flowers on every table that Joe Lyons was opening everywhere. 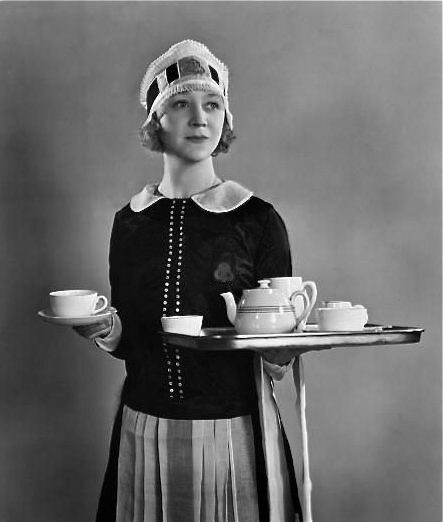 It was the dream of many a girl to become a Nippy in a Lyons Corner House, serving excellent food, quickly and cheaply, to thousands of people every day. A really vast Corner House, like the Coventry Street Corner House in London, could employ well over a thousand people, most of them women. Many women could also work as teachers in elementary schools, which were increasing in numbers and growing in size and as clerks in the Post Office, the civil service or local government, all of which expanded greatly in the 1920s and 1930s. The so-called ‘white-collar’ unions that grew in size and importance with the shift in British industry from heavy to light, and which included teaching and nursing as well as more commerce-oriented unions, saw a great increase in the numbers of women members in the 1920s and 1930s. Young middle-class women, most of whom had never contemplated any employment more serious than arranging flowers in their mother’s drawing rooms, could now consider leaving home every morning for secreterial and administrative jobs in commerce and the professions. Their access to higher education took them in increasing numbers into the universities, from where careers in medicine, law, academic life, business and politics were all now possibilities. The first woman to take her seat in Parliamen was Nancy Astor, in 1919, and the country’s first woman barrister was Dr Ivy Williams, in 1922. Margaret Bondfield, a founder of the National Federation of Women Workers, became Britain’s first woman Cabinet member when she was made Minister of labour in the Labour Government of 1929. By mid-century, women’s place in the workforce was accepted as normal. They might be paid much less tan men they worked beside doing the same job – an inquality that would not be addressed until later in the century – but they were on the way to being recognised as essential to the well-being of the world of work.